Looking for worksheet practice that doesn't feel like a worksheet? 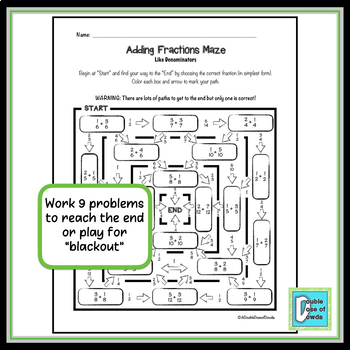 These mazes (at 20% off the individual maze price) allow students to practice adding fractions. Students must correctly add fractions (and decimals in Level 4) in order to find the correct route through a maze. 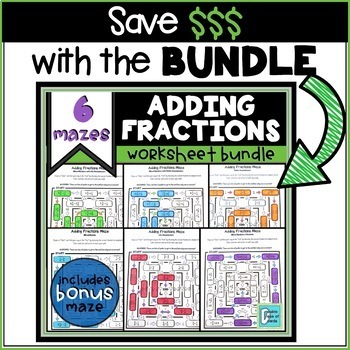 5 differentiated mazes are included in this bundle for a discounted price. 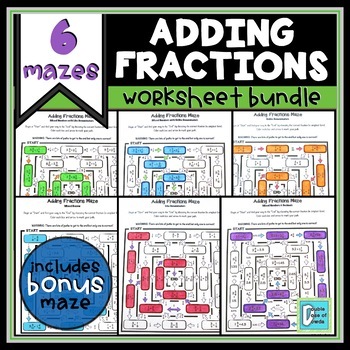 You may also want to check out our Subtracting Fractions Maze BUNDLE. It also contains 4 differentiated mazes, but for subtracting fractions. ♥ "Awesome! A fun approach that engaged my students in practicing these skills! Thank you!" ♥ "My kids really liked practicing skills this way!" ♥ "Mazes are my favorite to do in class, and I liked how I could differentiate with these!" Click here to FOLLOW US and get 50% off our new products for the first 24 hours. Purchasing this product grants permission for use by one teacher in his or her own classroom. If you intend to share with others, please purchase additional licenses at the discounted rate when you checkout. We TRULY appreciate your purchase and remind you that leaving feedback earns you TpT credit toward future purchases! If you have any questions, please feel free to contact us.